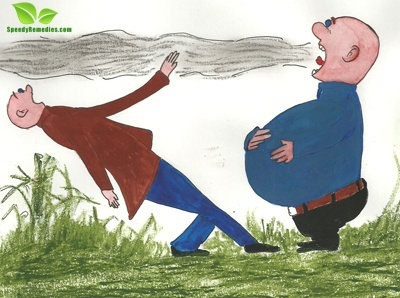 Belching or burping is caused by the release of gas buildup from the stomach through the mouth. It is a medical problem. It is usually accompanied by a typical sound. On rare occasions, a faint odor can also be there. Due to these characteristics, it is not considered good socially. Belching depends on factors like the amount of air that is swallowed, the amount of gas that is produced by digestion, and the efficiency with which the gastrointestinal tract moves and releases the air. One can easily link these factors with the process of healthy/unhealthy digestion. As a result, most of the natural home remedies for belching aim at improving the digestive system of the body. Babies are particularly subject to a buildup of gas in the stomach. In such situations, patting the baby’s back causes it to belch. They need to burp in order to expel or release the air taken in during feeding. To control the amount of air swallowed during feeding, limit the baby’s drinking time to about 10 minutes. It has been observed that nervousness also triggers belching. During nervousness or anxiety, people tend to swallow more air than needed. Some people burp artificially for fun. This forced belching is accompanied by more noise than the natural one. Sometimes, tight clothing increases the pressure on the abdomen which obstructs smooth air flow resulting in belching. Some people swallow too much air into the stomach. This condition is known as Aerophagia. This could be done while eating or drinking fast or talking while eating. Smoking cigarette or cigar also increases the intake of air. Excessive salivation increases air swallowing thereby increasing the chances of belching. Habits like drinking through a straw, sucking hard candy, drinking carbonated drinks like soft drinks, beer, champagne etc, wearing loosely fitted dentures, chewing gum etc facilitate the process of belching. Indigestion and heartburn caused by lima beans, baked beans, lentils, whipped foods like omelets, ice creams, improper digestion of sugars like lactose, Sorbitol and fructose present in milk, sweeteners used in preparing low calorie foods, candies and drinks lead to increased amount of belching. Certain types of starches that are poorly digested which are present in potatoes, cabbage, carrots, cauliflower, rice, whole grains, oats, apricots, prunes and other such fruits, vegetables and staples also create gas and in turn induce belching. Ailments like Pep tic ulcer, heartburn and Hiatal hernia may also induce belching along with other symptoms. Gallbladder disease, pancreatic disease, lactose intolerance, stomach acid deficiency, food allergy, emotional stress, obesity, reflux esophagitis and other similar ailments tend to encourage unhealthy belching. During fasting and pregnancy, there is a tendency to belch more often. Belching often occurs as a result of stomach ache or bloating caused by indigestion. It can be associated with excess stomach gas. An interesting symptom of unhealthy belching can be found out in the following way. Thump on your stomach when you feel like your stomach is full of air; the thumping will produce a sound similar to that of a hollow drum. Natural home remedies for belching mainly emphasize on having a healthy digestive system which can be achieved by adopting any one or more of the following measures. • Drinking a glass of water with half teaspoon baking soda is a very common treatment for belching. • Eating a few cloves of garlic before meals is a simple and equally effective cure for belching. • Taking herbal tea having blackberry, raspberry, mint and chamomile also helps reduce repeated belching. • Add 2-3 drops of mint essence in water and drink daily for around 15 days to avoid repeated belching. • Taking lime juice and cider vinegar in a glass of water before meals aids in digestion thereby reducing the problem of excessive belching. • Taking a pinch of asafetida in buttermilk prevents belching. This is one of the oldest natural home remedies for belching. • Taking fenugreek seeds soaked in water overnight, on an empty stomach, preferably in the early morning is also beneficial. A good digestive system automatically reduces belching. A diet consisting of a good number of digestive enzymes leads to healthy digestion. Cardamom helps reduce muscle spasms in the stomach, which can be one of the causes of belching. It increases the production of the digestive fluids in the digestive tract. Ginger is also very effective in preventing unnecessary belching. Pineapples and Pomegranate are good for digestion and hence help avoid belching. In case of lactose intolerance, switching to soy products instead of milk can also provide relief from belching. It is commonly advised to have soups before meals for proper digestion.